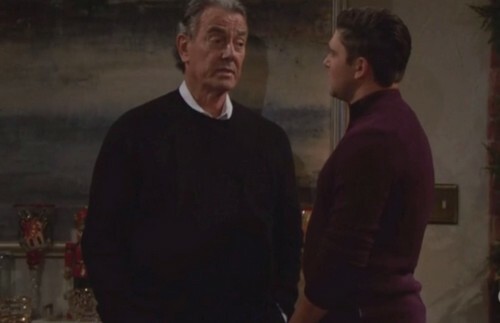 The Young and the Restless (Y&R) spoilers for the week of December 4-8 tease that some serious conflict is on the way. Several feuds will heat up, including Victoria (Amelia Heinle) and Abby’s (Melissa Ordway). These sisters will get continue to get on each other’s bad side over the next few episodes. If they can’t get a grip on the hostility, their war could spell trouble. Of course, Abby will have another issue to deal with. The Young and the Restless spoilers say Abby’s feelings for Scott (Daniel Hall) will grow stronger. Scott will also wrestle with his desires for Abby, but they’ll both attempt to control themselves. That plan may not work for long! Noah (Robert Adamson) and Tessa (Cait Faitbanks) will tackle some problems as well. Victor (Eric Braeden) will fill Noah in on Tessa’s recent theft. He’ll note that Tessa swiped Nikki’s (Melody Thomas Scott) gun and gave it to Crystal (Morgan Obenreder). Victor will gripe about Tessa dragging the Newmans into Zack’s (Ryan Ashton) death drama. He’ll add that Tessa’s just using Noah. The Young and the Restless spoilers say Noah will call Tessa out on all that. He’ll suggest that she might have an ulterior motive for being with him. Tessa will assure Noah of her love and apologize for keeping secrets. She’ll admit that she has a lot of emotional baggage, so Noah will forgive her. Meanwhile, Hilary (Mishael Morgan) will get a clue about Tessa’s risky decision. She’ll probably want to spill this scandalous story, but she’d better be careful. Devon (Bryton James) wouldn’t appreciate it if Hilary publicized all the dirt on his favorite recording artist. Later, Y&R spoilers say Hilary will connect some dots. She’ll reach an intriguing conclusion, so what’s this all about? Will Hilary figure out that Mariah cares about Tessa as more than just a friend? Regardless, Mariah and Tessa will inch closer to patching things up this week. It looks like Tessa will be desperate for some help, so Mariah may pitch in. As for Hilary, she’ll force Devon to face temptation. Hilary recently asked Devon to make Hamilton-Winters a sponsor for The Hilary Hour. He wasn’t interested, but maybe she can sweeten the pot and change his mind. Other Y&R spoilers state that Victor and Kevin’s (Greg Rikaart) partnership will be exposed. It sounds like Victor will have to do more damage control this week. We’ll give you updates as other news comes in. Stick with the CBS soap and don’t forget to check CDL often for the latest Young and the Restless spoilers, updates and news.